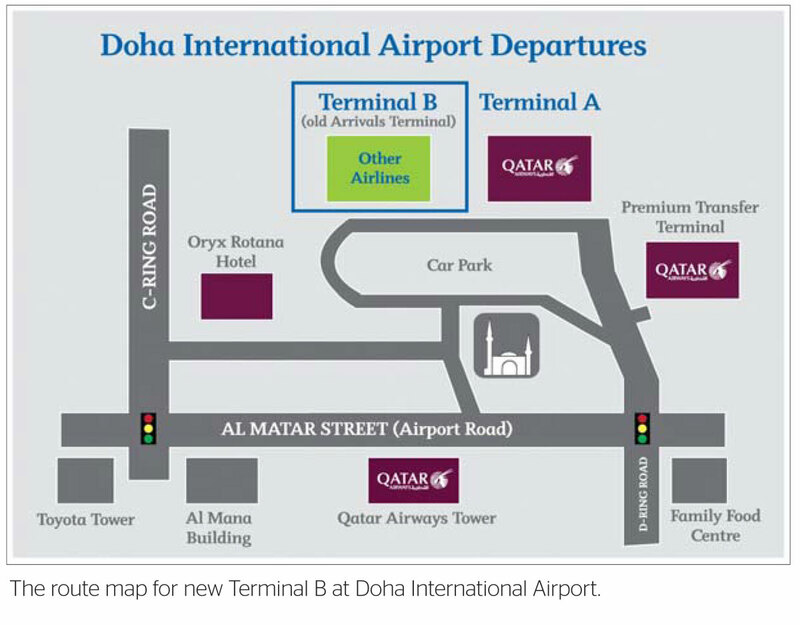 DOHA: City Center Doha's pay parking scheme is likely to be implemented from July 1, according to the mall's management. "Parking is a big problem at the City Center. So we came up with this new scheme for the benefit of our customers," Daniel Schweigel, Operations Manager, told The Peninsula yesterday. 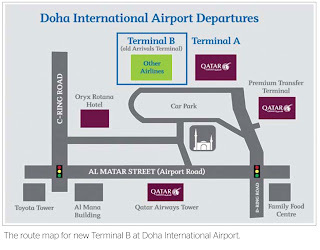 While there are other pay parking facilities in the city such as at Doha International Airport and Souq Waqif, the City Center is the first shopping mall to introduce the facility in the country, which could be an added burden for shoppers already saddled by rising prices. But the mall management says the new system would be more of a benefit to customers. "It takes a long time for a motorist to find a parking slot, sometimes it can take one hour to look for a space to park, but with the new guiding system it is very easy to find a place to park," said Schweigel. "On the top of every parking slot, will be an indicator which turns green when the space is available and red if it is not," he added, saying it would dramatically reduce the time spent for looking for a parking space. According to a circular issued to the tenants of the mall, the parking fee has been fixed at QR2 for the first hour, QR3 for the second hour, QR3 for the third hour and QR10 each for every hour thereafter. Visitors will not be charged during the first week, however, to famialiarise them with the new system. Asked whether it would affect footfalls in the leading mall, he said it would encourage more customers to drop in as they would find the parking more convenient. 'Seasonal tickets' are also available for the mall's tenants at a monthly rate of QR1,000 plus QR55 single payment for the ticket. 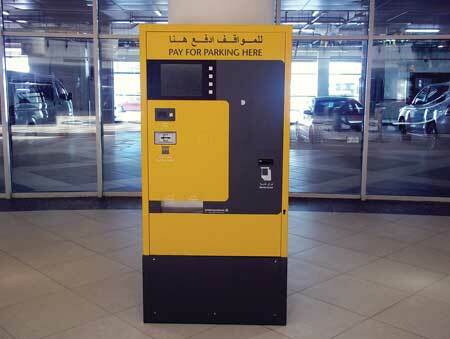 Besides, tenants can buy a 'validation machine' for QR5,000 which will enable them to validate customers tickets for one hour free parking as a customer service, the circular added. The mall's decision has been prompted by non-shoppers using the parking space. The City Centre is surrounded by high towers, many of which do not provide ample parking space for their employees and visitors. The move was seen a solution to ease the congestion in the parking space, a major problem encountered by many of the visitors to the mall especially during peak hours. Pay parking is not new to many residents since it is practised in many countries and Qatar is one of the few countries which have introduced it just lately. The mall has around 1,600 parking slots, 300 of which are occupied by mall staff. An additional parking space that could accommodate up to 400 vehicles was planned to be set up to alleviate the problem. Lack of parking space is seen to be a main problem as huge influx of people is expected this summer when people are left almost without any choice but spend their leisure time inside the mall as staying out is virtually impossible with temperatures crossing 50 degrees Celsius. the peninsulaoha's pay parking scheme is likely to be implemented from July 1, according to the mall's management. DAN JUGA DIJEMPUT SELURUH PENDUDUK AL-KHOR,KE MAJLIS PENYAMPAIAN HADIAH KEJOHANAN SUQMA - Q.
HADIAH SUKAN WANITA : JUARA PERTANDINGAN BOWLING, NETBALL & BOLATAMPAR. HADIAH SUKAN LELAKI : JUARA PERTANDINGAN BOWLING, TAKRAW & PING-PONG. UNTUK PENGETAHUAN SEMUA PASUKAN AL-KHOR ADALAH JUARA KESELURUHAN SUQMA-Q YG JULUNG-JULUNG KALI DIADAKAN DI QATAR MARI KITA MERAIKAN PEMAIN-PEMAIN DR PASUKAN KITA. Sekretariat akan menyewa bas 28 tempat duduk sahaja. tambahan terpaksa "diBELI" (oleh Hamlah) dengan bayaran yang lebih tinggi. mengelakkan sebarang kerumitan mendapatkan visa. mendaftar lewat - dikenakan bayaran QR550 setiap passport. diadakan sebagai persiapan untuk para jemaah, InsyaAllah. 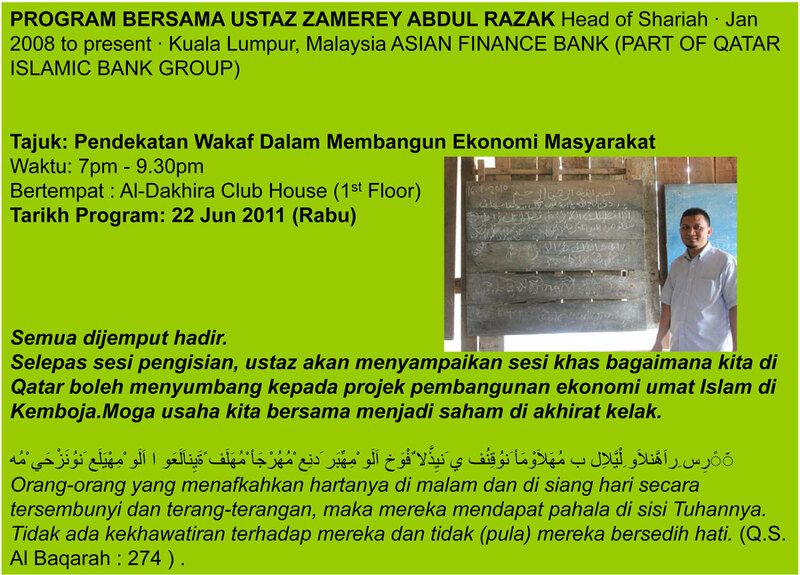 Tajuk: " Pendekatan Wakaf Dalam Membangun Ekonomi Masyarakat "
Selepas sesi pengisian, ustaz akan menyampaikan sesi khas bagaimana kita di Qatar bagi boleh menyumbang kepada projek pembangunan ekonomi umat Islam di Kemboja. 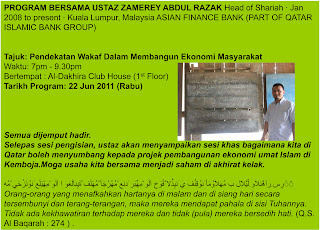 Moga usaha bersama kita akan menjadi saham di akhirat kelak.